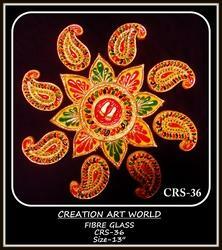 Carry rangoli setfiber glasssize- 18'' × 18"
Our competency lies in trading an excellent quality range of Folding Rangoli. Me or my hubby always used to make traditional Rangolis in the verandah of my house or around a god’s idol during Pujas, either at my residence or at my hubby’s native place. With the inclusion of modern equipment and sophisticated machines, we are engaged in offering a qualitative array of Folding Rangoli. Demanded for gifting and decor purposes, this array is a crafted carefully using high quality colors and painting techniques. 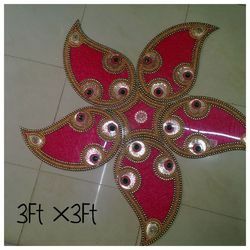 Offered rangoli is made available in an ample of sizes and colors.